“whatsapped” him asking if he will help to create the document. “Of course mum,” he replied. So, I decided to ‘jump into the deep end knowing that I don’t know how to swim’. The next step was to go through the previous themes and decide on one. Natural Sweeteners came to mind and I wrote to Stacy that I will be the host for July. Natural Sweeteners just popped into my head at that time. After doing a bit of research, its amazing how many natural sweeteners are available. Honey and maple syrup are the fore runners. Then add sweet fruits, dried without added sugar like dates, raisins, sultanas, prunes, apricots, figs,strawberries,raspberries,goji, cherries etc. Fresh fruits like mangoes, bananas, sweet apples are widely used to add sweetness to bakes. Pumpkins, sweet potato are widely used to add natural sweetness too. You may say that sugar is natural, made from sugar cane juice. I challenged the participants not use use any processed or centrifuged sugars or high fructose corn syrup or artificial sweeteners. This included no brown, demerara, turbinado, muscovado etc as they all go through some stage of centrifuging and processing. Natural occurring sweeteners that are widely used in Indian cooking are jaggery and palm sugar. With all the hype about coconut being good for health, coconut sugar is quickly becoming a popular natural sweetener. Do scroll down and check out how fellow bakers have used natural sweeteners in their bakes. My plan was to use jaggery in my bake but I forgot to carry the jaggery from home. Searched for jaggery in Montreal and was not really happy with the quality so I had to think of an alternate recipe. Our stopover from Nairobi was Doha just under 2 hours, before we flew to Montreal. I bought some dates at the airport thinking my son may enjoy snacking on them. 2 weeks and the tin was not opened. I decided to use them to make muffins. This will be my 10th bake for Bread Bakers group and till date except for the buckwheat pancakes I’ve baked with yeast. Decided to make something without yeast for a change. Hope you like my Date and Chai muffins. They tasted like Christmas cake, fruity and spicy. Hubby was really happy that he could enjoy muffins that had no sugar added. He is diabetic, but that did not mean he could gorge on them. Dried fruits without added sugar have low to moderate Glycemic Index and are a rich source of fiber, valuable nutrients and anti oxidants. P.S. Making the google document and html links was not difficult at all. I’ve learnt something new and feel great. Thanks to my son Neel for his guidance and to fellow member Renee Dobbs(Magnolia Days) for assisting me. Put pitted dates, raisins, prunes(or any other dried fruit you use) and water in a saucepan. Heat it over medium low heat till the mixture becomes a thick paste. Total cooking time was about 5 minutes. Let the mixture cool down completely. Transfer the mixture to a big bowl. Line a muffin tray with cake cups or grease it lightly with butter. Sift the flours, chai masala, salt, baking powder and soda bicarbonate together. Add nuts and mix. Beat the eggs lightly. Add it to the date mixture. Add butter, vanilla extract and orange juice to the date mixture and mix well. Add the flour mixture and mix just enough to get the flour wet. Don’t over mix. Bake for 20-25 minutes till the tops are light golden brown. Insert a skewer or toothpick into the middle of one of the muffins. If it comes out clean, the muffins are done. Remove the muffins from the oven and let them cool on a wire rack. Serve with some spicy tea, coffee or with a dollop of vanilla ice cream. * I make my own tea or chai masala (powder). Ready made chai masala is available in most stores or Indian stores. I chopped the apricots and prunes into big pieces after measuring them. Use sultanas, currants, dried blueberries instead of raisins. Make sure your fruits do not have added sugar to make these muffins totally without processed sugar. Most dried cranberries available in the stores have added sugar. I used dates that did not have any sugar syrup. They should be dry and not wet when you touch them. You can make them using wholewheat flour only. I added ½cup plain flour as I didn’t have enough wheat flour. Hello Mayuri, Your muffins look great. With orange juice, chai masala, vanilla extract and all the dry fruits, I can imagine the burst of flavours. Lovely recipe indeed. Thanks for sharing! Mayuri, thanks for being such a wonderful host and the theme is so good! I enjoyed looking for naturally sweetened breads and dates sounded great to me too!! 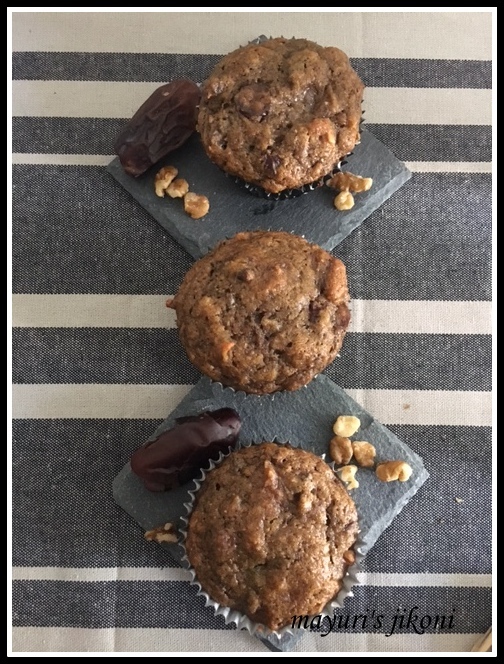 Your muffins with dates and chai look perfect 🙂 Orange juice adds to the flavor I am sure! Thanks for being the host for the month and choosing a lovely theme! It is my first time with the group and looking forward to baking a lot 🙂 Love the combination of chai and dates. Looks wonderful! Mayuri, so glad that you took the plunge and hosted this month and what a great theme you chose. I'm loving all the awesome bakes with natural sweeteners. Your date and chai muffins look so moist and delicious. Thanks so much for hosting Mayuri and for choosing this theme. I am sure that your muffins were very moist and lovely from the dates. Thanks for choosing this theme so fabulous. Your muffins are delicious, a perfect combination. These muffins sound so delicious! Also, thank you so much for hosting this month. It was a great theme! Thanks so much for hosting. I know how intimidating it can be. You did good!! While I have no idea what centrifuged means, I hope my barley malt passed the test. I figured it would be better to ask for forgiveness rather than permission. =) P.S. Your muffins sound delish! The muffins look very moist and tasty! it's very sweet of your son to help you out. You did come up with a very nice theme and thanks for hosting this month. Chai sounds wonderful with this fruit combo in muffins! Thank you (and your son) for hosting the month! Thanks Namita. They were very tasty and we also had them as dessert with a dollop of ice cream. Thanks Robin… do try out the muffins they are yummy. And the Html and google doc, I had a strict teacher 😉 my son. Renee also is a great help. Thanks Smruti. I loved the different ways the participants used natural sweeteners. Thanks Sandhya… dates and chai masala made the muffins taste like Christmas cake. Thanks Pavani. The task was not too difficult. I too loved the different bakes with natural sweeteners. Thank you Pam, muffins did taste fabulous. Thanks Wendy. Muffins were moist as I had boiled the dried fruits. Thank you Rocio. I loved your bake too. Thank you Julie, glad you liked the theme. Karen you don't need to ask for forgiveness because as far as I know, barley malt is a natural sweetener. The grains are sprouted whereby the grains starch is converted to sugar. Thank you so much Deepti. Yes, I learn something new from all my 3 kids whenever I meet them and now my daughter in law too offers a lot of help. These date muffins looks so soft and fluffy.